I am hardly alone in my apprehension about what a Donald Trump presidency means for the state of our Union. As we enter this new era, San Diegans should know that despite my grave concerns, I remain committed to solving problems and fixing a broken Washington. I will continue to work with anyone who has a good idea, regardless of political party or title, in order to create more prosperous future — and a government that works — for all Americans. So if President Trump and Republicans and Democrats want to work together to revise the tax code to support middle class job creation, bring offshore profits back home to invest here, repair America’s infrastructure, and keep America’s military the strongest and best in the world, I’m ready to help. However, if the President continues to pursue some of the extreme plans he campaigned on — a Muslim registry, defunding Planned Parenthood, a border wall, reckless climate policies — I will draw the line and fight back in the 115th Congress. Loyalty. I pledge loyalty to country and district first, ahead of political party. I’ll continue to work with both parties, and I’ll stand up to my party when I disagree. I draw the line when fighting the other political party at home becomes more important than defeating our enemies abroad. We need an honest investigation of Russia’s interference with our election. And we need to make sure our President and his cabinet put service before self and don’t use their positions of trust to line their own pockets at the expense of American interests. Truth. To solve our toughest problems, we must know and accept the facts. I draw the line when some try to obscure our very real challenges with made-up realities. We know climate change threatens our future; let’s act responsibly to find economy-friendly, science-based solutions that reduce emissions and protect our planet. We know our growing national debt threatens our ability to invest in the long term. That debt won’t go away if we pretend that more tax cuts for the wealthiest Americans somehow pay for themselves. They don’t. Opportunity for All. Too many hard-working people aren’t able to make ends meet. I will continue to work for policies that reward hard work and provide economic opportunity for all; everyone should have a chance to get ahead and realize their American dream. This means working with Democrats and Republicans to invest in our federal highways and bridges and ports to create jobs and spur commerce. It means investment in science and in education so our kids can compete in today’s brain-powered economy. It means fixing our immigration system so we have the workforce we need, from farms to hospitals to laboratories. I draw the line against counterproductive policies like burying our children in student loan debt or wasting money on a multi-billion-dollar border wall. Strength Abroad. I commit to maintaining America as the world’s leader in peace and strength. That means supporting diplomacy at the Department of State and our military at the Department of Defense. It means bolstering America’s economic leadership through global trade standards that increase protections for workers around the world while leveling the playing field for American workers here at home. And it means drawing the line and fighting back if our future president wants to undermine our long-standing alliances at NATO, allow the proliferation of nuclear weapons or abuse our military strength in order to antagonize, or incite war. Respect for All. Finally, I draw a line against the divisive and malicious tone set by President Trump, from his campaign to his speeches to his tweets. I commit to kindness and compassion in all that we do as a Congress. That means caring for the poor and sick and others in need of help. It means remembering that discrimination has no place in a nation as great as ours and that immigrants and refugees are men, women and children, often fleeing danger and always seeking a better life, just like our ancestors. It means following the Golden Rule, and assuming the best in others — including my colleagues whose political ideology may be different from my own. I will continue to treat every one of my colleagues with respect and appreciation for their service to our nation. These are the guideposts San Diegans can expect me to follow. We should demand no less from the President of the United States. 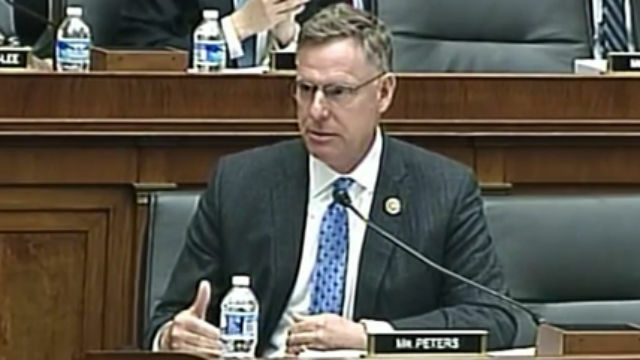 Rep. Scott Peters serves the 52nd District, which covers much of central San Diego County including Poway, Coronado, and large portions of the City of San Diego. This op-ed originally appeared in the San Diego Union-Tribune.